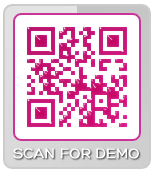 Using SMS and Email Opt-in for QR Code marketing / advertising. Mobile SMS and Email Opt-in helps create customer database. How to use mobile SMS and Email Opt-in to build customer database. Stay in front of your consumer base and build loyalty with SMS and Email opt-in for mobile devices. Mobile SMS and Email Opt-ins reside on mobile landing pages and send information directly to your email and or database. Mobile SMS and Email Opt-ins are trackable calls-to-action. Full analytics are available. Scan the code to opt-in to PRINT2D's e-newsletter or Text Alerts.